So, I’ve cut out a dress for me, but i haven’t started putting it together, because I’ve been busy making something else instead. I haven’t really shared anything about our kitchen, which is strange because it’s the only room in the house we’ve actually renovated! I’ll have to write a big before and after another day, but for the time being, I’m just going to talk about the shelves I just built, because I’m so excited! When we moved in, we had two really awkward shelves on the back wall. One was quite narrow, and closest to the wall, while the other one was much deeper, but in the middle of the wall. I constantly bumped my head on it, and it made the area feel really claustrophobic. 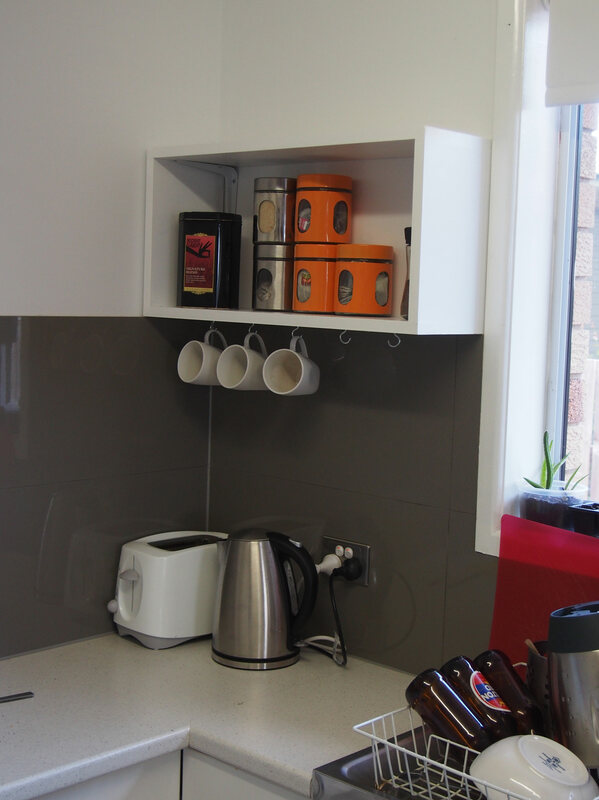 The big shelf held the microwave, while the smaller shelves was where we stored tea/coffee, mugs and glasses. When we renovated, those shelves were the first to go. Once the wall was painted and tiling completed, the wall seemed empty. The microwave had been relocated to the pantry with the mugs and glasses, and the tea and coffee bits were just on the bench. 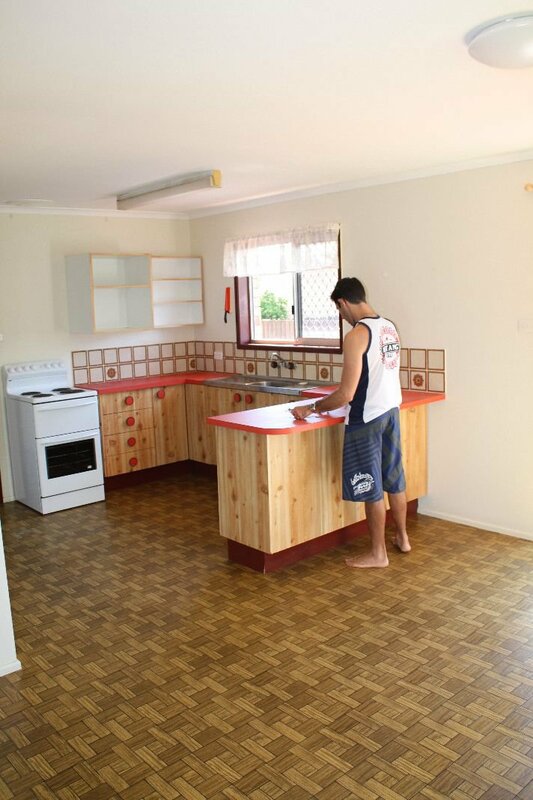 I didn’t want to repeat the sins of the past by adding cupboards, so shelving was the best option. Open shelving can be a grease and dust magnet in kitchens, especially ours because we only have a ceiling extractor fan, not a proper rangehood. I thought that boxed shelves might help, so that’s what I built. They’re super simple construction, just glued and screwed. I filled the ends with fine putty, then sanded them smooth. 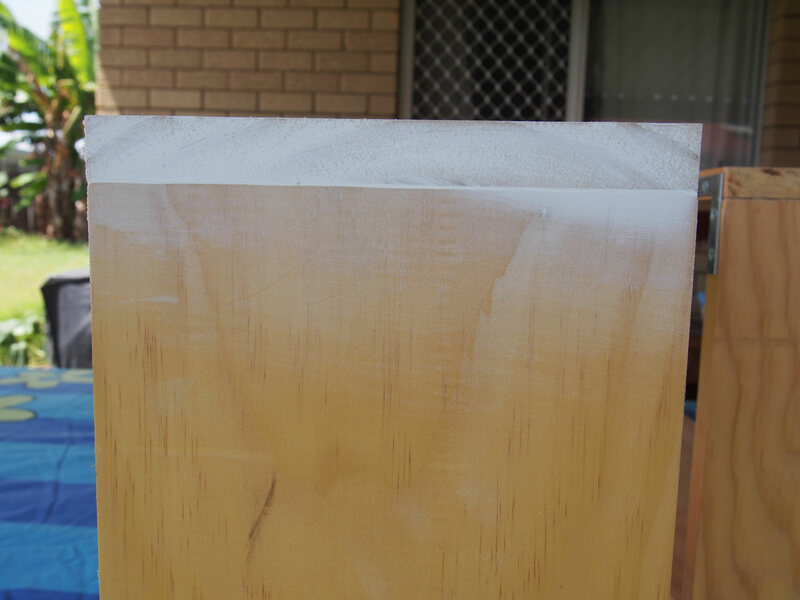 A couple of coats of undercoat and a top coat of white gloss, and they were ready for installation. I used the same brackets I used in the bedroom, and where possible, fixed them into studs. The bracket in the corner was too far from the stud though, so I used plasterboard anchors. 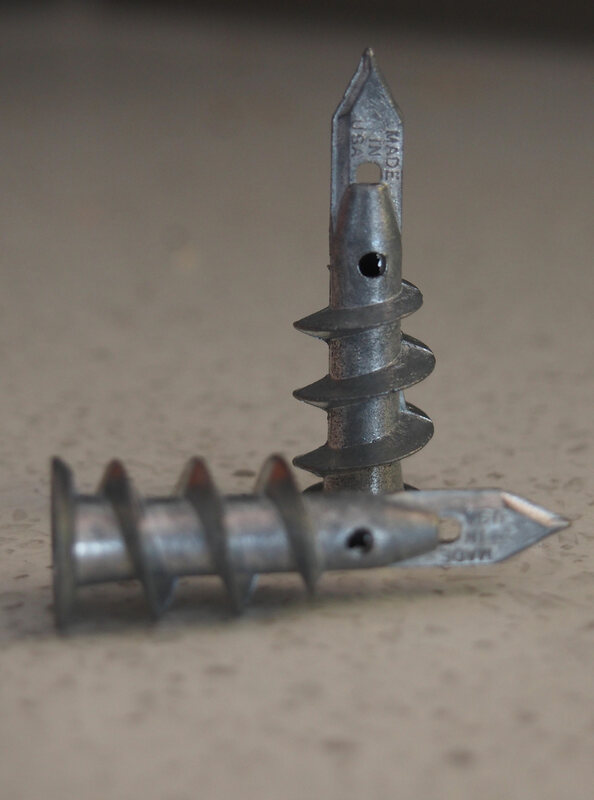 I love these things – they look like something Wile-E Coyote would use to drill underground to catch the Road Runner. Anyway, they are one of a range of options you have when fixing to plasterboard, and are very easy to use. Theoretically they’re self tapping, but I like to drill a pilot hole first (lets you know if there’s a stud behind the plasterboard too). 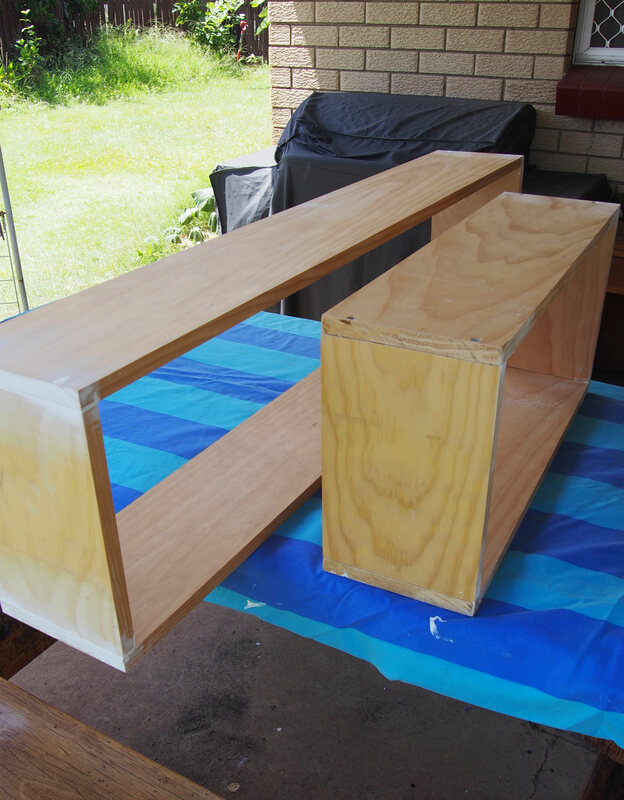 Once the brackets were screwed in, the box shelf just lid straight over the top, and then it was just a matter of screwing them in at the top. 16mm screws would have been best, but I only had 12mm, but they’ll do the job. I still have the larger one to install on the back wall, but couldn’t manage it single handed (I did try balancing it on my head, but I didn’t get very far!). Hopefully by tonight it will be finished!